Cole McKinney with the Bridge Emergency Shelter in Cortez opens the door for a client on Tuesday. The Bridge was founded in 2006 to help keep homeless residents from dying from exposure. The shelter’s new building is currently under construction. Thirteen years ago, a small group of volunteers in Cortez vowed to do something about homeless people dying in their community during the winter, so they opened an emergency shelter. “People didn’t think a human should die with their cheek pasted to the sidewalk in the wintertime,” said M.B. McAfee, who helped found the shelter. Done entirely with volunteer labor, the Bridge Emergency Shelter opened in the former Montezuma County Jail in three rooms. The effort eventually evolved into the Bridge building a two-story, $2.5 million shelter this year that will provide both emergency shelter for single adults and transitional housing apartments. Cortez has achieved what Durango, so far, has not. Insufficient housing for homeless residents in Durango has been contentious this year because many end up camping on public land. Residents have been particularly concerned about the fire danger the camps posed and insufficient sanitation for human waste. A recent white paper by the American Civil Liberties Union and the National Law Center on Homelessness and Poverty also highlighted the need for additional housing options for homeless residents in Durango. 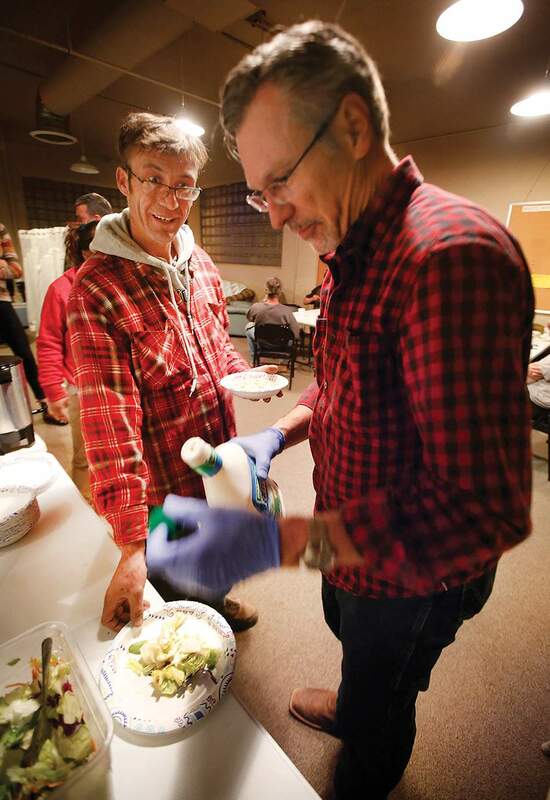 Mike Shelton, a volunteer with the Bridge Emergency Shelter, makes a salad for Daril Stuckman on Tuesday night in Cortez. Stuckman, a Cortez native, became homeless seven years ago after his aunt sold his grandmother’s house. The legal groups reviewed 12 months of citations the city police gave to homeless people sleeping on the ground without a tent and determined they were incorrectly applying the camping ban. “The citations clearly show that Durango police officers enforce the ‘no camping’ ordinance as a ‘no sleeping’ ordinance,” the report stated. That compounded the challenge for homeless people who have few options. At the Durango Community Shelter, families and sober homeless adults can stay for up to six weeks. Citing safety reasons, the shelter does not accept those who drink or are otherwise intoxicated, said Rachel Bauske Frasure, Volunteers of America division director. The VOA oversees the shelter. At the VOA shelter, a single employee spends the night at the shelter and sleeps on-site to be available in case of emergency. But staff cannot provide the supervision necessary to allow intoxicated guests. Allowing intoxicated individuals would also be a negative influence on those staying at the shelter trying to maintain sobriety, she said. “A low-barrier shelter would allow for a safe, warm place for folks to sleep that are not quite ready for sobriety, are not eligible at the current Volunteers of America shelters or for folks that just need a night away from camping outside,” she said. In a few cases, Durango homeless residents have died outdoors by natural causes, murder or from a drug overdose. In 2015, a young homeless man was seriously injured when he was attacked by a bear in Durango. The Bridge Emergency Shelter is temporarily housed in Grace Fellowship Church in Cortez, while a new, permanent building is being constructed. In Cortez, a community of 8,000, it was the deaths of homeless residents that motivated volunteers to open a shelter. McAfee grew up in Cortez during the 1940s and 1950s when it was common for homeless residents to die in a park near her house every winter. In the 2000s, homeless residents were still dying on the streets, she said. The task force of about 30 volunteers decided to open the emergency overnight shelter in January 2006, she said. “Our first mission statement of the task force was: ‘We are going to stay open for 90 days and nobody will die,’” she said. The Bridge is now a seasonal shelter that operates 180 days a year serving adults, whether they arrive sober or not. The shelter’s operating costs are about $230,000 annually, Executive Director Laurie Knutson said. In the 2016-17 season, the shelter served 359 people, and last season, it served 361 people in a building that could house about 50 people at a time. In recent years, about 45 residents each year have moved on from the shelter into some form of housing, she said. Although, it is a tough number to reliably track, she said. The shelter does not set a time limit on the number of days an adult can stay, as long as the client abides by rules, such as a zero-tolerance policy for violence, Knutson said. The absence of a time limit is rooted in the shelter’s original mission to keep residents alive, she said. Without the Bridge shelter, Daril Stuckman, a Cortez native, said he would likely camp out, as he does during the summer. “I would probably be out there in a cave,” he said. In the shelter’s early days, volunteers worked overnight shifts. Some started at midnight to keep the shelter open, said McAfee, who brought some expertise to the work as a former social work professor. Churches were important partners and helped supply food and volunteers, she said. While running the shelter, volunteers were taught how to deal with homeless residents showing up drunk, how to manage bedding, how to request donations and many other details. “We just learned, and it was really slow,” she said. 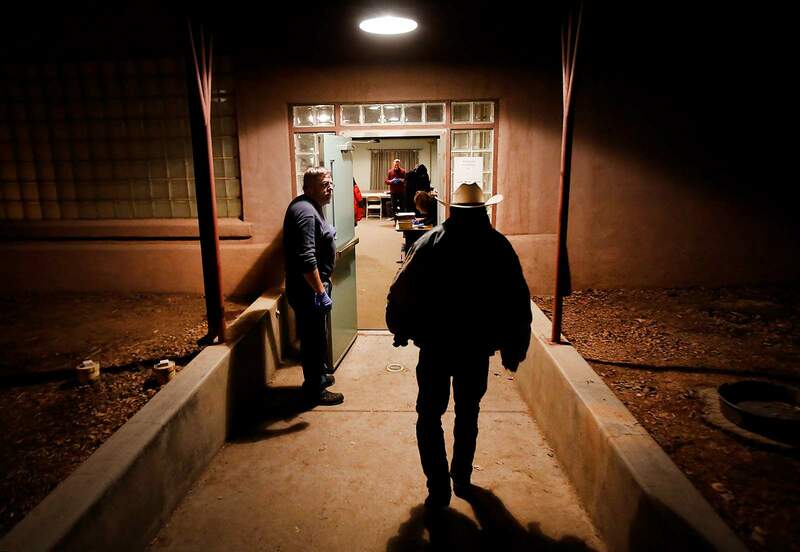 Randy Lee Skinner8, who spells his name with a numeral, stays the night at the Bridge Emergency Shelter in Cortez on Tuesday. Skinner8 said he was living with his mother, but when she died about three years ago, he became homeless. Without the shelter, he said he would have left town. But he wants to stay to be close to his daughter. 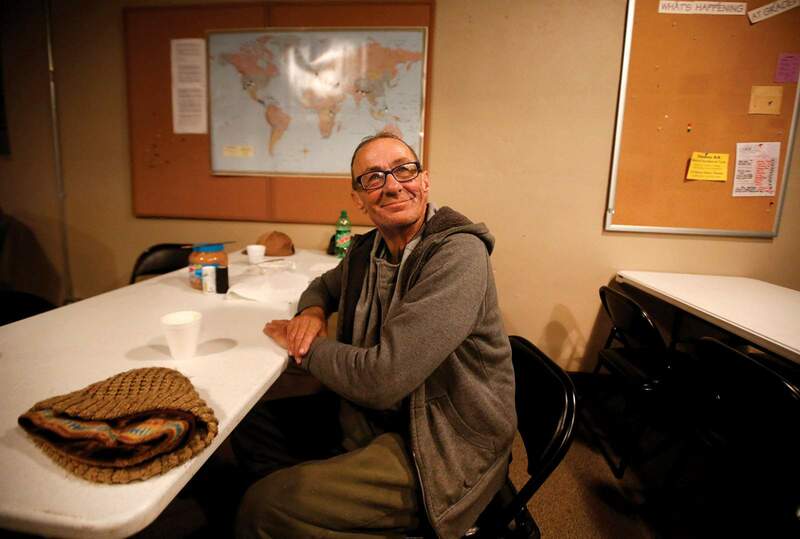 Cortez did not have a homeless resident die during the shelter’s first winter, McAfee said. Homeless residents have died since the shelter opened, but Knutson could not say how many. Doubtless, the shelter has also saved lives, but it is impossible to quantify, she said. Over the years, the shelter raised money to hire staff and an executive director, and it partnered with the Piñon Project and Axis Health System to provide health care. It also took over a day-labor center to help clients reach independence. McAfee said she wanted the shelter to open up space for families, but that has not yet happened, she said. Some families in need of a place to stay do not want to travel to the Durango shelter, so some split up to stay with family or friends, McAfee said. The city of Cortez and Montezuma County provided minimal financial support over the years, McAfee said. “We had to just beg and beg for everything,” she said. This year, Montezuma County sold the shelter’s facility to the Children’s Kiva Montessori School. The sale required the shelter to temporarily move into Grace Fellowship Church. The sale also resulted in the Bridge building a new facility that will house about 27 people in transitional apartments. Knutson said she expects most people will stay in apartments between six and 18 months. It will also have emergency shelter space for about 24 people. One of the foundational components to operating a shelter in a small town is accepting that those who come to the door are dealing with more than bad luck; often their lives are “messy,” Knutson said. Residents may lose their home because their spouse died and they don’t make enough to afford their home anymore, she said. Mental health, substance abuse and other untreated medical conditions can also play a role, she said. A basic way to help normalize life for homeless residents is to provide space to sleep, eat and keep clean, she said. Would you like to see an emergency shelter for homeless residents in Durango like the Bridge Emergency Shelter in Cortez?